Many jobs are going offshore faster than a Ghost Busters ghoul. Computer programming, web development, and a bunch of other tech skills lacking in the U.S. lead this pack. However, English as a second language is a problem for foreign writers who seek to offer content for the U.S. market. Great writers stateside communicate clearly with an economy of words. Offshore writing English as a second language tends to ramble. This is great for word count, but not so good when getting to the heart of the matter and the heart of the prospective customer. Advantage–USA! I suggest that in content marketing and public relations, you pinch pennies in areas outside of content creation. Who is your target market market? If it’s highly educated folks with advanced degrees you may get away with writing at a Flesch-Kincaid index 13th grade level with average sentence length of 23 words per sentence. Conservative columnist Charles Krauthammer writes at that level in this example. “For all the hyped indignation over GOP “anarchism,” there has been remarkable media reticence about the president’s intransigence. He has refused to negotiate anything unless the Republicans fully fund the government and raise the debt ceiling — unconditionally. Charles uses lots of big words. There are nine four-syllable words in the first two paragraphs. He also averages 23 words per sentence. This results in a Flesch Reading Ease score of over 40. Time (52) and Readers Digest (65) are both easier to read–the higher the better for this index. By comparison, Florida requires insurance policies to stay above 45 by this measurement. Making me read insurance stuff would definitely be a Halloween Trick at any time of year. 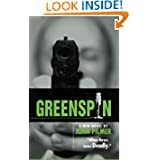 After writing the first draft of my thriller novel, GreenSpin, I found that it was somewhere around a 11th grade reading level. Since the average novel is between 6th & 7th grade level, I had to shorten sentences and use less big words for final copy. So, if you hire out your writing, keep it Made in the USA. When you write, keep long words to a minimum and sentences short. That is, if you want to do great Content Marketing, listen to the ghosts of great writers well remembered. Spelling thanks to my 12th grade English teacher, Mrs. Herrington, for teaching the value of writing well.